4K HDMI extender over fiber integrates HDbitT technology in one standalone kit , allowing you to transport HDMI 4K-2K - 25/30Hz signal up to 20km. This HDMI extender supports IR back transmission function as well. 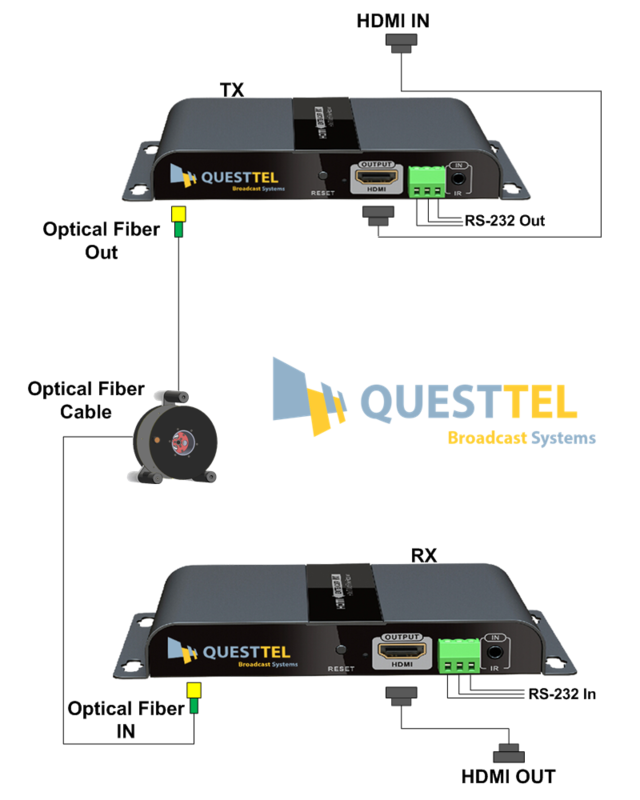 The QuestTel L-1HDMI-FE-RS-232-TX/RX Fiber Optic Transmitter and Receiver provides long haul transmission of high resolution HDMI signals over a single fiber up to 20km and multimode fiber 500m with RS 232 control signal. Engineered for reliability and exceptional high resolution image performance, it uses QuestTel technology to deliver perfect pixel-for-pixel transmission of computer-video images up to 1920x1080@60Hz resolution. 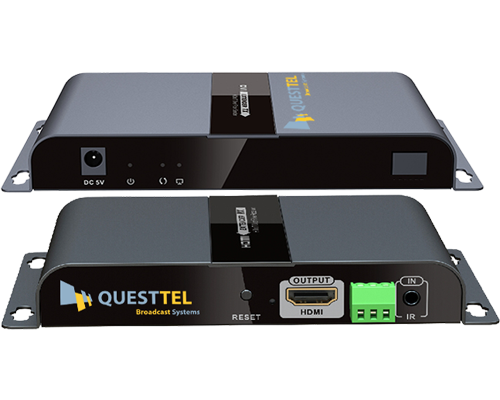 Fully compatible with HDCP QuestTel's solution includes Transmitter and Receiver for HDMI signal over fiber transport, it's also featured with IR back pass function which allows you to control your device remotely over single fiber. 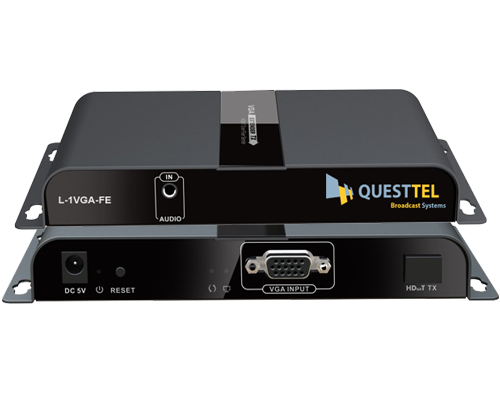 The QuestTel L-1DVI-FE-TX/RX Fiber Optic Transmitter and Receiver provides long haul transmission of high resolution DVI signals over a single fiber up to 20km. 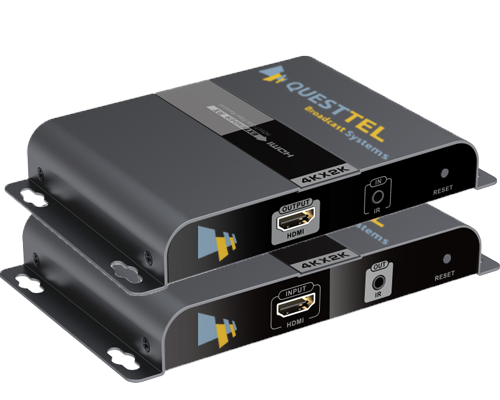 Engineered for reliability and exceptional high resolution image performance, it uses QuestTel technology to deliver perfect pixel-for-pixel transmission of computer-video images up to 1920x1080@60Hz resolution. 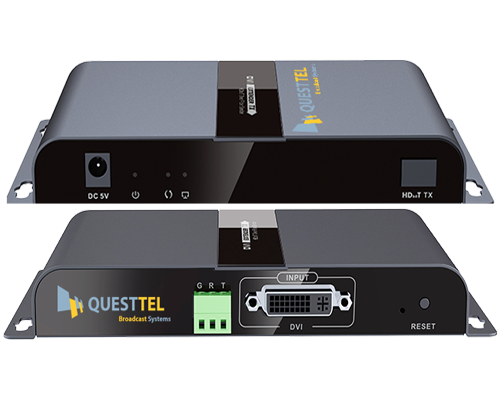 The QuestTel L-1HDMI-FE-RS-232-TX/RX Fiber Optic Transmitter and Receiver provides long haul transmission of high resolution HDMI signals over a single fiber up to 20km and multimode fiber 500m with RS 232 control signal. Engineered for reliability and exceptional high resolution image performance, it uses QuestTel technology to deliver perfect pixel-for-pixel transmission of HD video up to 1920x1080@60Hz resolution. The compact, low profile enclosure of the L-1HDMI-FE-RS-232-TX/RX allows for discreet installation. It can be used for simple point-to-point applications or handle the most challenging AV system designs, from a simple conference room to an enterprise-wide fiber optic distribution system. The FE-RS-232-TX/RX Transmitter and Receiver is ideal for a wide range of applications requiring long distance transmission of high resolution content with the highest quality. Because transmission of content is inherently secure and immune to outside interference, fiber applications are favored in government, military, and medical environments. The transmitter features industry standard SC-type Optical Connector. 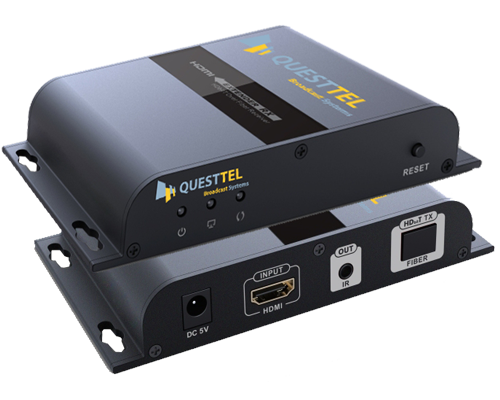 QuestTel FE-RS-232-TX/RX supports multimode and singlemode transmission. Singlemode fiber offers long-range transmission capability over extreme distances of up to 20 km (12 miles). It is used in very large facilities such as airports, stadiums, live broadcast signal transmission, remote studio, universal digital video transmission business, telecommunication signal transmission business, airport or transportation hubs as well as connecting over very long distances between facilities such as college campuses. Resolution supported is up to 1920x1080@60Hz. Support RS232 Bi-directional pass back . Avoid the electromagnetic interference in environment for long distance transmission. Low signal loss, wide frequency band and strong anti-interference. Wall-mountable design, easy for installation.